There was a copy of “Mischief in Patagonia” in the school library. By the time I had got as far as university I had read the other books. And then the thought occurred that I wanted to do some proper sailing before “settling down”. I wondered if Tilman were still alive and still had a boat? A brief item in a yachting magazine suggested that he had been active just a few years before, so I found a current copy of the now-extinct “Lloyds Register of Yachts” and looked him up in the “owners” section. A boat named “Baroque” – was listed and an address somewhere in mid-Wales. No telephone number, however. I decided to call on him and since I had a girlfriend at the University of Wales I persuaded her to drive over to Barmouth. Walking up to the house I had second thoughts about calling un-announced, and fled precipitately! I then thought of Plan B – write a letter asking if he wanted a crew? By return of post came a reply saying that the position of cook was vacant if I wanted it. I did, and was told to show up in Lymington at the end of May. We never spoke or met. The day after my Finals saw me on the train, with kitbag, to Lymington, where I located the Berthon Boatyard and, alongside a quay, an orange gaff cutter. I had hit a “good crew year”. Paul Rheinsch and Alan Stockdale were friendly and plainly capable. David White had yet to appear – to my relief in view of HWT’s “at last!”. When he did he too fitted in well. Fitting out and stowing stores and gear were things I could show myself useful at. As cook I had charge of the stores – 96 cans of corned beef, 24 tins of pilchards, and much more of the same. The folklore about “short commons” was just that – we had good plain food and plenty of it! David appeared, we settled down and finally set off – eastwards. By the middle of the North Sea, even I had worked out that this was not the direct route to Greenland, so I asked Paul if the skipper were planning to call at the Faeroes? Paul was a bit surprised and said that he thought we were heading for Spitzbergen non-stop and that the skipper would not want to put in so much Westing. This was when I realised that we were not going to Greenland – I had not asked HWT where he was bound and he had not told me! It did not matter to me. Not being a climber, all I wanted to do was to sail to somewhere cold, remote and unfrequented and have HWT approve of me as crew. The lack of a chess set, overlooked on setting out, was plainly going to annoy HWT as soon as his hoard of “Times” crosswords ran out, so Alan and I made one with crude carved pieces pegged into a board. David and I mastered the art of duff making. We saw a huge whale- possibly a Blue – and became blase about pods of killer whales frolicking about. As we worked slowly North the weather varied between the unremarkable and the mildly unpleasant. HWT assured us that as soon as we got into the Arctic High all would be well – and it was. Nothing can prepare one for the first sight of an icebound coastline, glittering in the sun, or the fact that icebergs really can be a brilliant turquoise colour. 24 hours of daylight, in such surroundings, has much to recommend it. The “plan” of the voyage was to get round Spitzbergen and to do some climbing. Paul and Alan very kindly took me, a non-climber, on some simple scrambles between serious climbs, while HWT preferred climbing on his own. high and were ice bound. The feeling of the crew was not “blame the skipper” but “Thank God it wasn’t me!”. The Pilot Book read “Nordenskjiold surveyed this strait (between Edgeoya and Barentsoya) from the Northern shore and pronounced it passable”. We had our own opinions about Nordenskjiold as we dumped the ballast, the water and the spare mainsail! I rather enjoyed the experience since as an “east coast” sailor I knew all about “kedging off” and could show off! The tide seemed to rise and fall very little, but rushed past at a great rate, reminding HWT of the Patagonian channels. The worrying part was that the tide was carrying rather large ice floes with it, the smallest of which, had it scored a direct hit, would have made rather a mess of the boat. Luckily some bigger floes managed to ground uptide of us at each turn of the tide, giving us a partial breakwater after the tide had run for a bit. 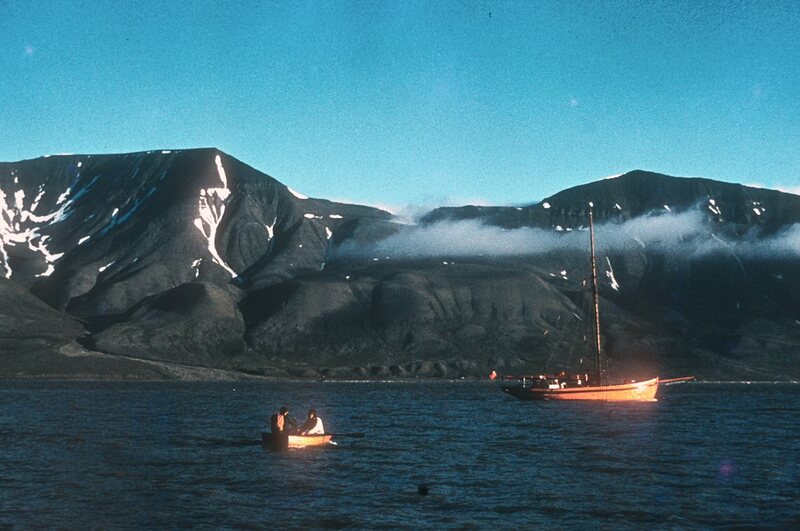 After an exciting 24 hours, during which the unspoken thought of a desperate row, followed by a very long walk carrying the dinghy, another more desperate row and an even longer walk to Longyearbyen avoiding bears, must have occurred to all of us, we got off. The trip home was a little less comfortable as the rudder had been damaged and we had to “nurse” it, which ruled out heaving to, while quite a lot of space was taken up with the granite boulders we had shipped as substitute ballast. More seriously, the food supplies were running low, so HWT determined to call in the Faroes for victuals. However, as we approached their latitude the fog closed in, so we stood clear and hoped to find the Shetlands. No luck – the weather closed in again. HWT remarked “you can do two weeks with no food – no water is serious” and being now somewhat to the West decided to make Stornoway and return home via the Irish Sea. I will not forget the taste of beer, black pudding and chips in Stornoway on a Saturday night! Having no charts of the Irish Sea on board HWT constructed his own from Reed’s Almanac. We rounded Lands’ End and had a splendid run up Channel to the Needles – almost the only fair wind of the trip. None of us had any doubts about HWT’s competence as a seaman and navigator; his tendency to err on the side of caution, as in not closing the Faroes, and reefing down and heaving to early on, were always to the fore. We crew used to enjoy trying to sail fast, knowing that before long HWT would appear and require a reef in! His abilities in working a small wooden boat through ice were notable. His watch system was two hours on, six hours off, with the cook taking the 2 to 4 in the afternoon to move the watches round, since he said that two hours was long enough in cold climates. Sail changes were, if possible, at the change of watch. He was most insistent on a good look out being kept. “Baroque” had a Terylene mainsail, staysail and jib and a flax trysail which was something of a brute and when wanted regularly was kept in the pram dinghy at the foot of the mast . The Terylene sails needed quite regular restitching. An Avon was also carried together with a valise liferaft which no-one expected to work. The anchor gear was substantial as was the supply of anchors – two of which we lost in getting off from the grounding – and warps. HWT navigated using the Air Tables and a deck watch in the approved style of the 1950’s; the only other navigational gear was a radio receiver for time signals, a Walker log for transferred position lines, and a lead line – after about three casts in freezing conditions one longed for an echosounder! Working through ice he liked to have a view from the ratlines frequently.During the most difficult parts of the passage, through Hinlopenstretet between Spizbergen and Nordaustland, he would anchor for a rest in the lee of any convenient island and climb it the next day for a view of the ice before setting off. Timan’s legendary taciturnity could be “thawed out”. The requirements were an achievement, followed by an extra good meal, ideally on Saturday evening when the rum bottle was produced. Once persuaded to talk, he was fascinating.